(Trent Nelson | The Salt Lake Tribune) Real Salt Lake hosts FC Dallas, MLS soccer at Rio Tinto Stadium in Sandy, Saturday July 7, 2018. 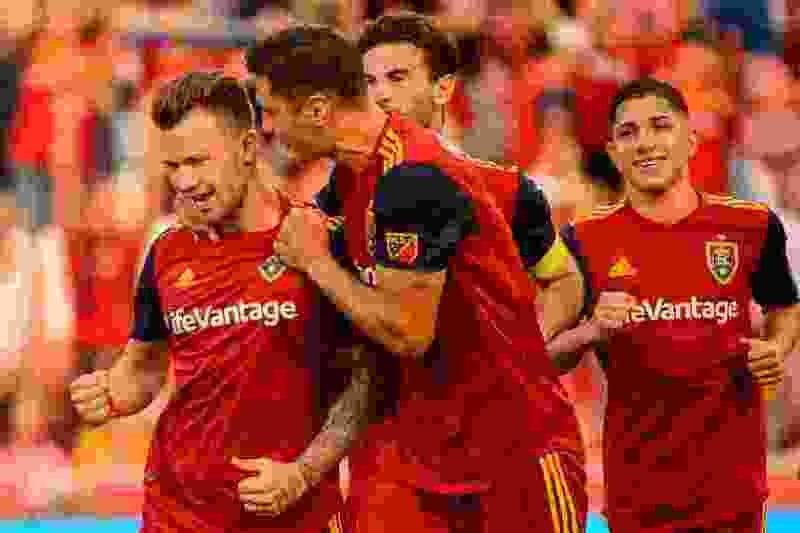 Real Salt Lake midfielder Albert Rusnak (11) and Real Salt Lake midfielder Damir Kreilach (6) celebrate a penalty kick goal by Rusnak. Real Salt Lake did itself a huge favor with its dismantling the New England Revolution on Thursday. Without a victory, the team might as well have kissed its playoff hopes goodbye. But now, with only one game left — Sunday against the Timbers in Portland — all RSL needs to do is win one more game. One more game and it can punch its ticket to the playoffs. Who they would face will remain a mystery until next Sunday, when every other team in Major League Soccer plays their final game of the regular season. Real’s goal is to earn the three points against the Timbers so it can rest easy and not scoreboard-watch while every other team plays. But what if that ideal situation doesn’t transpire? Say RSL ends up with a draw against Portland. Or worse: loses. After all, the Timbers are the same team that thumped RSL at Rio Tinto Stadium home before the international break. To top it off, Portland keeper Jeff Attinella will be available after missing the last game against Real with a dislocated shoulder. And, the L.A. Galaxy are only four points behind RSL in the standings, while the Vancouver Whitcaps are six points away. Here is a look at how RSL can still qualify for the postseason if it doesn’t win against the Timbers. RSL currently has 49 points and is the only team in the Western Conference playoff picture with fewer than 50. A tie with Portland would bring its total to 50 and put it five points ahead of the Galaxy. But here’s the rub: the Galaxy has two games remaining in its schedule, while RSL has just the one against Portland. To finish the season, the Galaxy face Minnesota United and the Houston Dynamo — two teams that are eliminated from the playoffs and thus have nothing to play for. If the Galaxy win both games, they leapfrog RSL into the sixth and final playoff spot. RSL needs the Galaxy to at least tie one of their remaining games in order to keep its position. Vancouver is not a threat if RSL ties Portland. Here is where things get a little more tricky. The aforementioned scenario in which the Galaxy win both of their remaining games is still in play. But if the Galaxy win one and draw the other of their two games, RSL and L.A. would tie in points (49). That brings forth the tiebreaker scenarios the MLS has, the first of which being total wins. Because RSL would finish with 14 wins and the Galaxy 13, Real wins the tiebreaker in this scenario, giving it the playoff spot. With the Whitecaps six points behind RSL, winning both games tie Vancouver with RSL in total wins (14). In that event, the next tiebreaker is goal differential. RSL current goal differential is even, while Vancouver’s is minus-15. Barring the Whitecaps finding a way to score 15 or more goals in their final two games against playoff teams — on the road against LAFC and home against Portland — and the Galaxy losing both their games as well, it seems unlikely they make it over RSL.